These functions perform logical shift or rotate, either left or right, on data register A. In some layouts the lazy points are drawn close together so more stages can be shown. This 6-stage circuit shifts data one stage to the right. The least significant bit 'x1' is lost, so if the register represents a binary number then it is halved (divided by 2), with no fractional part. When all stages have been copied, the most significant bit 'x32' is set to 0. 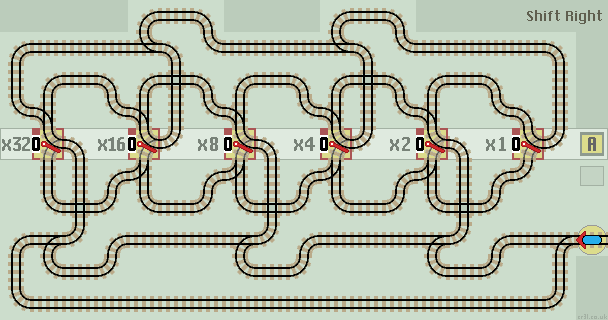 This circuit is used in the Random Number Generator. 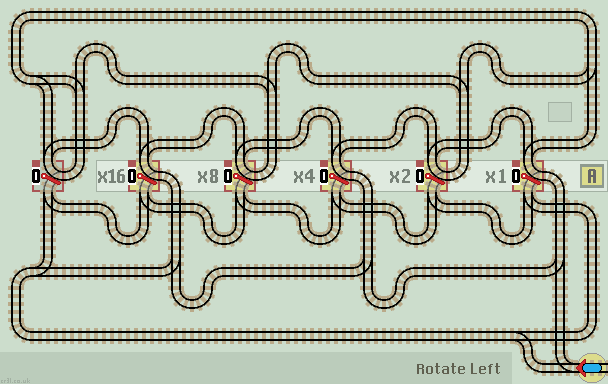 A compact (but wider) version of this circuit is used in the Average Function. This 5-stage circuit rotates data one stage to the right in the same manner as the shift right circuit above. The difference is that the least significant bit 'x1' is not lost. It is stored in an extra lazy point and read into the most significant bit 'x16' position when all stages have been shifted. This 6-stage circuit shifts data one stage to the left. The most significant bit 'x32' is lost. When all stages have been copied, the least significant bit 'x1' is set to 0. If the register represents a binary number (with a leading 0) then it is multiplied by 2. 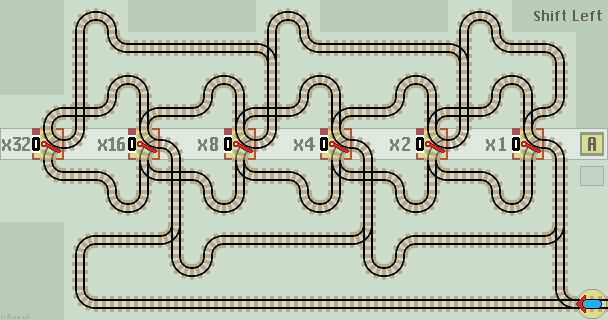 A compact (but wider) version of this circuit is used in the Multiplier circuit. 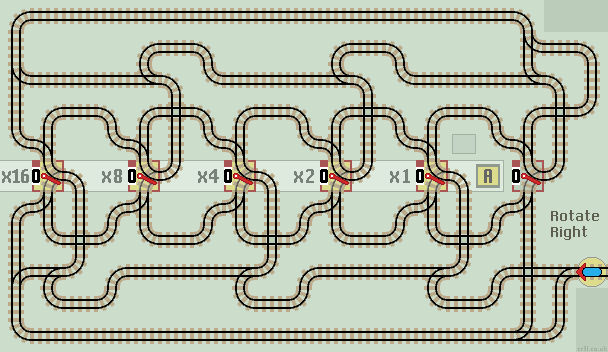 This circuit uses single lazy points to hold the value from each stage before transferring it to the next. This allows all stages to be the same and the train works from LSB to MSB. Not used in any other layout. This 5-stage circuit rotates data one stage to the left. The most significant bit 'x16' is not lost. It is stored in an extra lazy point and read into the least significant bit 'x1' position when all stages have been shifted.